Born in Trelawny, Jamaica on August 21, 1986, Bolt turned pro in 2004 after a successful youth and junior career. At his first Olympic Games in 2004, he was eliminated in the first round, while suffering through a leg injury. Four years later, the world would be formally introduced to the sprinter who runs at a whopping 23.7 mph. Bolt holds the World Record in the 100m, 200m, and 4x100m relay, his three signature events. Combined, Bolt has taken home six Olympic gold medals as well as numerous other awards and accolades. His honours include IAAF World Athlete of the Year, Laureus World Sportsman of the Year, Track & Field Athlete of the Year, and BBC Sports Personality of the Year. Despite his triple gold medal performance at the 2008 Beijing Olympics and leap into the world’s eye, Bolt had not been very successful in the 100m discipline up to that historic victory. It has been noted that Bolt’s finishing time could have been even better, given the runner slowed up at the end and began celebrating. It’s hard to believe, but Bolt first aspired to be a professional cricketer. Can you imagine this energetic speed demon sitting idly and going through the long matches that make up the wicket sport? 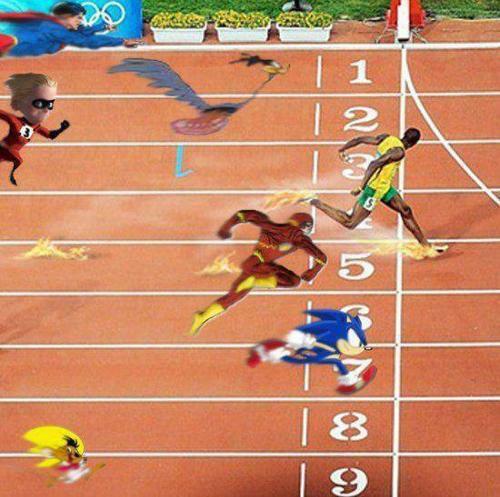 Instead, he takes care of business in under 10 seconds (20 for 200m races). Anyway, it was his cricket coach who steered him towards sprint running after noticing the athlete’s intense speed. Bolt is also an avid football fan (of the European variety, of course) and has dreamed of suiting up for Manchester United when he retires from sprinting. 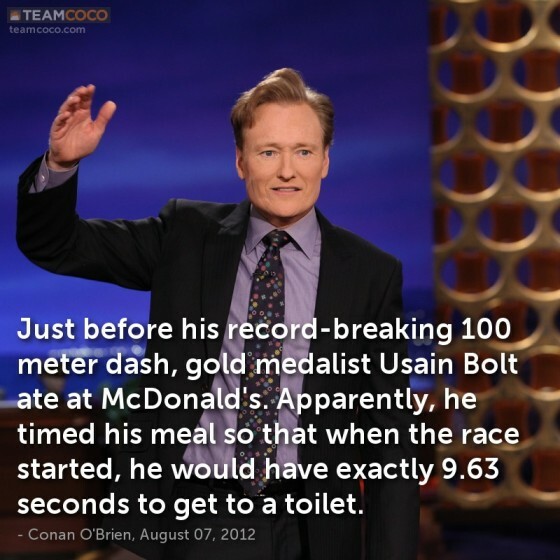 Talk about an athlete you can love and respect: the man ate Chicken McNuggets throughout his time at the 2008 Beijing Olympics. Apparently, Bolt was afraid to eat anything else while in China and estimates he consumed 1,000 McNuggets over his 10-day stay in the country. Somehow this didn’t lead to a McDonald’s sponsorship deal… perhaps it’s because his favoruite fast food restaurant has been noted as being KFC. The Sip Advisor doesn’t like tying his shoe laces and apparently this is a trait shared with Bolt. The difference is, I’m an booze enthusiast who needs to be able to remove his shoes in the worst of stupors, while Bolt is a finely-tuned athlete who participates in a sport where equipment could make all the difference. 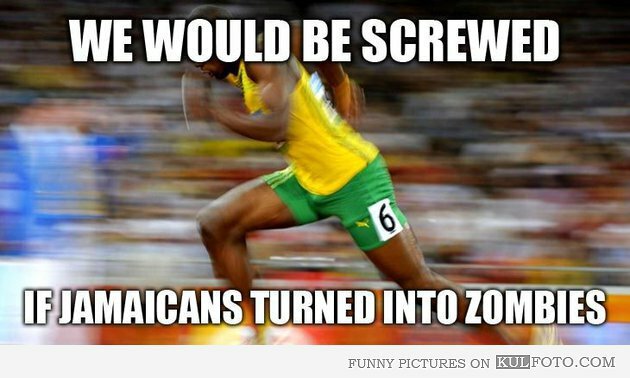 Bolt even ran his record shattering 100m gold medal race with laces undone. Bolt has his own mobile game app, Bolt!, which sees the track star running from pirates while trying to collect gold coins and avoid obstacles. Bolt is also a playable character in the wildly popular Temple Run video game series, which follows a very similar premise, just minus the pirates. The runner’s famous victory pose, dubbed ‘To Di World’, is more commonly known the world over as ‘Bolting.’ I’m still waiting for my ‘Sipping’ stance to take the universe by storm, but Mrs. Sip tells me I shouldn’t hold my breath. Then again, it’s not like I can really kill any MORE brain cells! Bolt enjoys annual earnings of over $20 million, coming from prize money, appearances, endorsements, and even the Jamaican government. He has promotional deals with Puma, Visa, Nissan, Virgin Media, Gatorade, and many others, which account for all but approximately $300,000 of his net worth. The Jamaicans are a musical bunch (our next post will focus on reggae and the Rastafarian movement) and Bolt even has his own line of headphones. Soul Electronics signed a deal with the runner to be their global ambassador. He also has his own restaurant and sports bar in Jamaica, called Tracks & Records, as well as a clothing line. 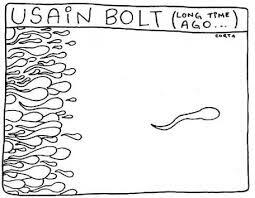 An autobiography chronicling Bolt’s life was released in 2010. Titled ‘My Story: 9.58: Being the World’s Fastest Man,’ Bolt said of the book at a press conference before it hit store shelves: “It’s my life, and I’m a cool and exciting guy.” Sounds about right for a guy who in his free time enjoys dancing and DJ’ing and has been described as laid back… everything you might expect from a Jamaican appearing in a Red Stripe beer commercial! I can’t believe how many similarities the Sip Advisor shares with this world-class athlete. From the untied shoes to supporting Manchester United to our mutual love of chicken nuggets… look out, Mrs. Sip, I think I’m falling in love with the man! This cocktail’s liquor mix was interesting with Jagermeister being invited to play with the rums. Once again, Pineapple Juice isn’t a favourite mixer of mine, but it was decent here. 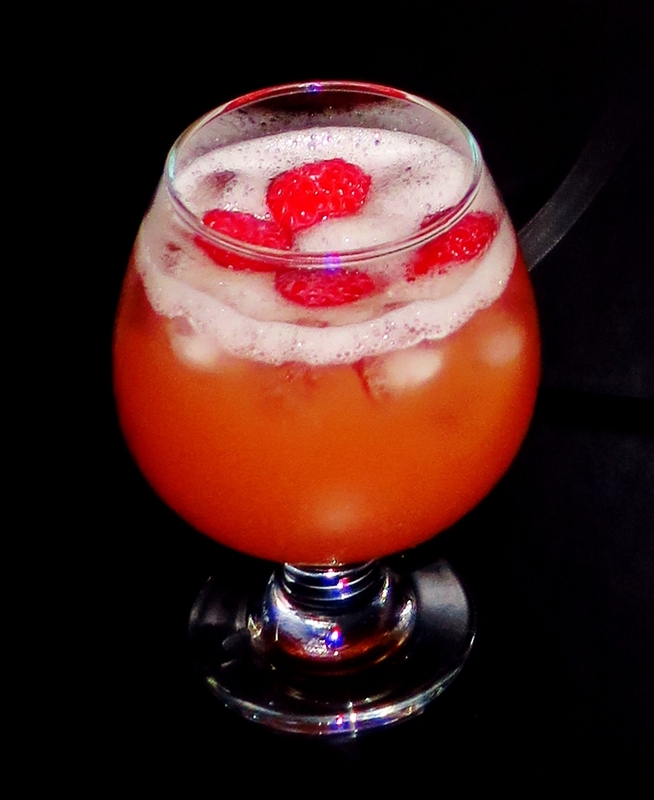 I’ve always loved Raspberries as a garnish and this rendition was no different. This entry was posted in Crazy & Classic Cocktails and tagged Appleton Rum, Bolt!, Bolting, Chicken Nuggets, cocktail, coconut rum, Cricket, football, Gatorade, Jagermeister, Jamaica, KFC, Lightning Bolt, Manchester United, Neo-Tropical, Nissan, Olympics, pineapple juice, Puma, raspberries, Raspberry Liqueur, Temple Run, Tracks & Records, Untied Shoes, Usain Bolt, Virgin Media, Visa by Daniel Wilson. Bookmark the permalink.